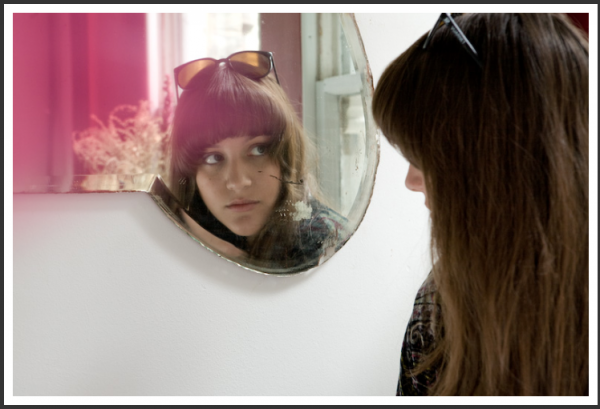 Caitlin Rose is quickly becoming a well-known name not only in the US, but also in the UK. In fact, her debut album Own Side Now is actually hitting shelves over there (on Aug. 9th via Names Records) before it comes out stateside. As of right now I haven’t heard any specific details on the US release, but it will no doubt be on Theory 8. This girl is headed for the stars and I have no doubt she will eventually make a sizeable impact on both country and indie music. I say that because she has purposely beaten her own path into the jungle that is the music industry, and avoided anything and everything to do with Nashville’s music row, home of modern pop-country. I must lay down a disclaimer that I’ve known Caitlin for a good 2 years now, and know about her for at least 4, if memory serves. My first encounter with her was when she tagged along with Joel J. Dahl (of De Novo Dahl) to perform with him on my radio show Fascination Street on 88.3 WMTS (MTSU’s college station). She went under the name “Save Macaulay” at that time, and played early versions of “One Speed Confessional” and “Shotgun Wedding.” (I think) To remember that and then listen to this album is pretty overwhelming. It’s not the comparison of then to now that overwhelms me, but that her performance then was nothing short of awesome, and she was only about 17 at the time! Furthermore, the track “Song for Rabbits” on the new album was actually written when she was 16! Enough silliness. This album does her songs a lot of justice. The production plants her new “full band” sound firmly in that alt-country, indie-folk gray area. I think that’s right where she needs to be, at least for now, and it seems to be where she’s comfortable. She selected a group of session players to fill out the songs with strings, pedal steel, etc… and they nailed it. The album was recorded and produced by Mark Nevers (of Lambchop), who’s done studio work with the likes of Clem Snide, Silver Jews, and Bonnie “Prince” Billy. It was a perfect match of style, and with so many of Caitlin’s main influences being 70’s era Linda Ronstadt, Fleetwood Mac, Loretta Lynn, etc… his vintage analog recording gear created some very satiating sounds that fit her songs perfectly. I only have a digital copy, but I can’t wait to give this thing a listen on vinyl. Caitlin’s voice and amazing storytelling ability still remains the focus of the album, even though it’s filled with expansive instrumental performances, which is a testament to Nevers’ production skills. The placement of harmonies and guest vocals always complements the melodic aspects of the songs without stepping on the story being told. If there’s anything I could wish for on the next album, it would be to maybe hear her cut loose and really belt it out a little more on the rockin’ songs like “Shanghai Cigarettes.” But that’s just me forcing myself to be critical and nit-picky. This is a damn fine record by a girl who’s got more talent in her little finger than most of us have in our whole body. Grab the track “Sinful Wishing Well” from the new album below. And now watch this video of an early demo of “Shanghai Cigarettes.” Then compare it to the album version when you buy it, and prepare to have your mind blown.